The withdrawal of the 36-year old American provoked some dramatic scenes at Doral with overhead camera shots of him driving away from the resort briefly took away from the action unfolding on the TPC Blue Monster. McIlroy provided much of it, mounting a thrilling final day challenge for his first WGC victory. The 22-year old holed a bunker shot for an eagle on the 12th to get within a shot of the lead before eventually carding a 67 to finish third, just two shots behind winner Justin Rose on 14 under par to move to the top of the FedEx Cup standings and the US money list. The world No 1 was disappointed to fade at the finish but immediately called on Woods to make a speedy recovery so they can battle each other for Masters glory in Augusta next month. “It’s a shame, because he looked like he was coming out this year, swinging it really well, playing good, getting himself into contention,” McIlroy said after his 12th top five finish in his last 13 starts, a run that also includes three victories. “It’s probably just precautionary, but I really hope he’s healthy for the Masters, because obviously it would be a great week with him there. “Tiger Woods has been the face of golf for the last 15 years. It feels like he’s coming back to his best or something near his best, it’s great for the game. Happy families. 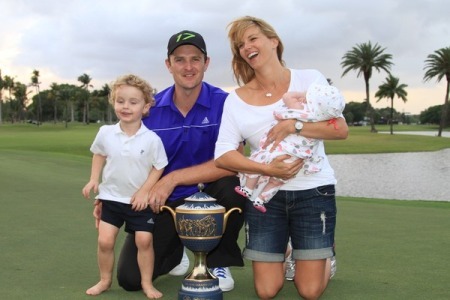 Justin Rose with wife Kate and family after winning the WGC-Cadillac Championship. Photo Eoin Clarke/www.golffile.ie Rose carded a final round 70 to set the target at 16 under par but then looked on as overnight leader Bubba Watson hit a miraculous, 187-yard approach from the right rough to nine feet at the 18th. The left-hander, wayward all day, needed a birdie to force sudden death but missed the putt to card a disappointing 74 and finish alone in second on 15 under. The big story of the day was Woods, who insisted afterwards that it was left Achilles and not his left knee that forced him to withdraw. Visibly limping after hitting his approach into water left of the par par-five 10th, he came out of his second shot at the 11th, carving it into a bunker right of the green before being after his drive at the par-five 12th, he withdrew and was ferried off the course in a buggy. “I felt tightness in my left Achilles warming up this morning and it continued to get progressively worse,” Woods said in a statement. “After hitting my tee shot on 12, I decided it was necessary to withdraw. It now remains to be seen if he will be fit for the Arnold Palmer Invitational at Bay Hill next week or the Masters in three weeks’ time. Eight shots behind Bubba Watson starting the day, McIlroy was pleased to give the title a run on the final day after following birdies at the first, seventh, eighth and 10th with that spectaculr hole out from a bunker for eagle at the 12th. Rory McIlroy drives at the eighth. Photo Eoin Clarke/www.golffile.iePushing hard, his title challenge faltered when he bogeyed the 14th to fall two off the pace and while he birdied the 16th, he missed the fairway and the green to bogey the last and end up on 14 under. “I played well at the weekend,” said McIlroy, who shot a 65 on Saturday to move up to eighth and has now earned $2.39m from just three starts on his return to the PGA Tour. Not set to return to action until the Masters, McIlroy added: “I’m feeling more and more comfortable going into these type of situations. Last week I felt pretty comfortable with the lead and I felt pretty good on the back nine today. Graeme McDowell shot a closing 70 to share 13th on seven under as Darren Clarke strung together his first two sub-par rounds since last November when he added a 69 to his third round 68 to finish tied 43rd on three under. 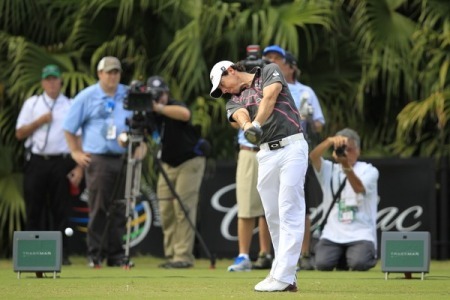 “Rory is going to have a fair bit of expectation on him going in there,” McDowell said. “He’s probably expected to win, and that’s tough. It’s just a case of how he handles it. McDowell does not deny that McIlroy has the sweeping right to left tee shot and the high ball game required to win multiple Masters. 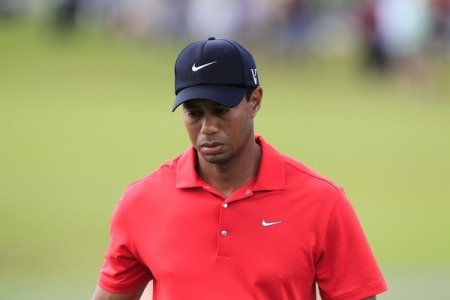 Yet despite all that, McDowell believe Woods would be the dream winner for many, given his dramatic fall from grace since his off course problems came to light at the end of 2009. McDowell said. “It’s his record at Augusta. Again, he’s got that ball flight, his iron play and the way he controls his irons going into those firm greens. But Clarke certainly does not believe that McIlroy will struggle to deal with the hype that sure to follow the Co Down man to Augusta National. “I was obviously gutted for Rory the way it unfolded for him last year,” Clarke said. “But it didn’t take him long to learn. As for his own game, Clarke was pleased with his weekend performance after months of frustrating play. But for the 18th, which cost him seven shots over four rounds, he could have finished comfortably inside the top 15 at Doral, where Bubba Watson held a slim one shot lead over Justin Rose early in the final round. Yet he refutes suggestions that his slump in form has anything to do with the added pressures of being a major winner. “It’s a case of patience and I don’t have any,” Clarke said. “But I think I got some confidence today. That was almost as good as I could play. “I’ve really kept expectations under control. Apart from a couple of months after winning the Open, when I was enjoying myself and having a good time, I have been working really hard. Cadillac Championship winner Rose also believes that McIlroy will be ready for anything at Augusta.